The island of Santorini in Greece is one of the most beautiful natural wonders of the world. Santorini is one of the places that that should be on every traveller’s wish list. The island is one of the most beautiful and romantic places on earth and definitely the most beautiful of the Cycladic Islands. Santorini is famed for the incredible views which can be seen along the Caldera (cliff). The island is also known for its spectacular sunsets, quaint towns, blue domed churches and white washed houses. 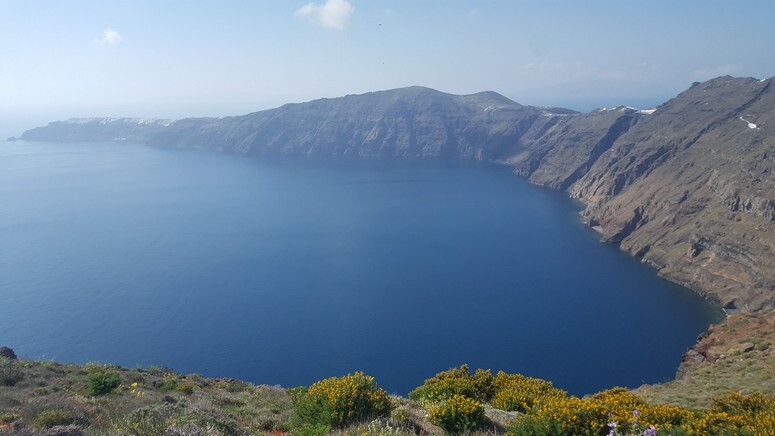 Originally named Thira, the island was renamed Santorini after St Irene in the 13th century. The name was given by the venetians who conquered the island during that time. The island of Santorini has four distinct parts to it. The most popular area is The Caldera with its spectacular views and stunning villas. The second part of the island is the volcanic black coloured beaches located on the south east of Santorini. These beaches are home to many restaurants and popular beach clubs. The western coast of Santorini features clear waters with pebble beaches and the last part is the centre of the island. The Caldera is without a doubt the most popular area and everyone wants to stay here. There are four main traditional white washed towns clinging to the cliff top. They are called Fira, Imerovigli, Firastefani and Oia (pronounced locally as eea). Every town is a picture postcard full of cobbled streets, restaurants, bars and a selection of both touristy and chic shops. No matter where you are on the Caldera the views will literally take your breath away. 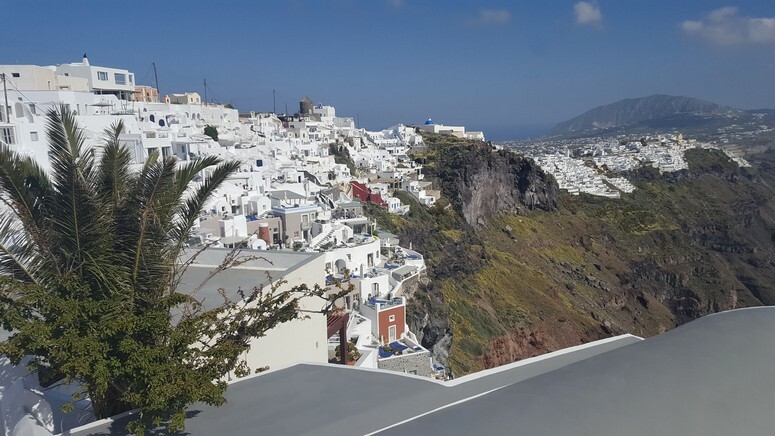 Tourism is a big business in Santorini but despite the fact that the island can be very busy in high season, anyone who visits will not fail to be impressed. The capital of Santorini is the town of Fira, often called Thira. The town was originally founded in the late 18th century. Before that the capital of the island was located at Skaros below the town of Imerovigli. The reason for this was that it offered easier access to the sea. The rock of Skaros and the iconic church below which is often seen in pictures of Santorini is one of our favourite places on the island. The town of Fira is full of cobbled meandering pedestrian only streets. It offers a good balance between very touristy shops to lovely art galleries and smart boutiques. There is also an excellent choice of restaurants with great food as well as bars where you can enjoy a cocktail whilst taking in the breathtaking scenery. Sunsets in Santorini are a big deal. About an hour before sunset people gather at the most north westerly point of the island in the town of Oia. Everyone visiting for the first time is vying for the best spot but the reality is all the spots are amazing. There are numerous cliff side bars, tavernas and restaurants to enjoy a sunset cocktail all along the edge of the cliff. The second the sun descends in the sea, you will hear a crescendo of clapping all around to celebrate the moment. This is one of the most iconic and most photographed scenes in the world. Oia has a lot more to offer than just the sunset. It is a picture postcard town with narrow cobbled streets that are lined with lovely stylish boutiques, art galleries, smart jewellery shops, blue domed churches and a huge variety of restaurants and bars to. Again the views from all points of Oia are simply breath-taking. One of the loveliest aspects of Santorini is a car free pathway that goes all along the cliff top parallel to the coast line on the Caldera. It is possible to walk all the way from Fira to Oia. The distance is about 9 kilometres and it takes just over 2 hours. Longer in the months of July and August as you will need to walk more slowly. It is important to bring water. The other ways to get to Oia is with a car via the main road or take a boat or sunset cruise which leaves from the port of Vlychada. The cruise takes about 5 hours and passes by some remote beaches where it is possible to swim as well. You can also enjoy dinner and cocktails at sunset before returning to the port. The history of Santorini is very interesting. The island is a perfect crescent shape and is the result of a cataclysmic volcano which occurred over 3,600 years ago. The eruption is reputed to have taken placed between 1350 BC and 1450 BC. Before this, Santorini was a much bigger circular volcanic island. The massive eruption literally blew out the middle of the island. The rush of water to fill the void caused a huge tsunami throughout the region that went as far as Crete. The volcano, which is still active, erupted again in 197 BC and again in 1707 AD and created two more islands which may be seen from the Caldera. These two islands called Nea Nameni (which is still the active volcano) and Palea Kameni are part of the reason the views are so astonishingly beautiful. 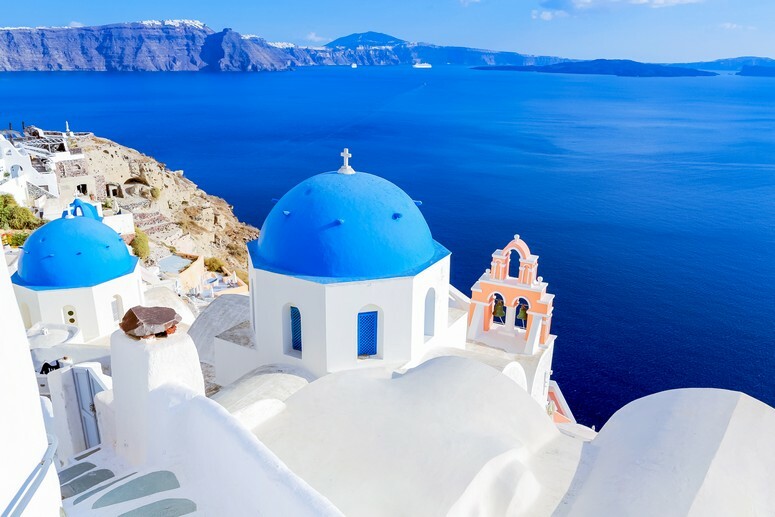 Santorini is located 125 miles southeast of the mainland of Greece. It is part of the Cyclades group of Aegean islands and experiences a fairly temperate climate throughout the year which makes it one of the world’s most sought after travel destinations. The shoulder months of April, May, Sept and October can be quite cool in the evenings so it is wise to bring something warmer for those months. July and August are by far the hottest months with temperatures reaching into the 80’s and 90’s Fahrenheit. The winter months from November to April, the average temperatures are in the 60’s with lows of around 50 degrees. The temperatures below are average temperatures and average rainfall for Santorini.